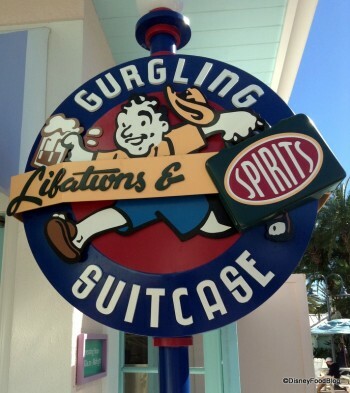 Nestled between Olivia’s Cafe and Good’s Food To Go at the Old Key West resort is a little gem of a lounge with a cute name — the Gurgling Suitcase. We say “nestled” because while it’s not the biggest lounge in the World, what it lacks in space it makes up for in charm, with a highly themed interior and festival tropical drinks like the Turtle Krawl, Sultry Seahorse, and Tropical Depression. Disney’s standard bar menu, along with a list of special tropical drinks you’ll see scrawled on a board on the wall. Typically open from 4:30-11 p.m. If you can’t find seating inside the bar, head outside to grab a seat or across the breezeway to the library-like area near the check-in desk. Famous Drinks: The Turtle Krawl, a mix of rums, pineapple, orange and key lime juice with a splash of grenadine; or the Sultry Seahorse: Disaronno, creme de banana, orange and pineapple juice and a floater of cherry brandy.